The EAERE Award for Outstanding Publication in the JOURNAL ENVIRONMENTAL AND RESOURCE ECONOMICS (ERE), recognizes exemplary research published in ERE during the past year. The award is given annually and announced at the EAERE Annual Conference. Any article published in ERE during the preceding year is eligible for this award. There is no requirement that the author(s) be a member of EAERE. a cash amount of EUR 750, to be divided equally between co-authors. “A Model of Benchmarking Regulation: Revisiting the Efficiency of Environmental Standards“, Environmental and Resource Economics, Volume 62, Issue 1, September 2015 , Pages 59–82. 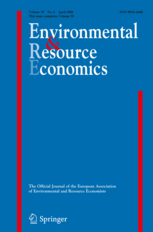 “Meta-Modeling and Benefit Transfer: The Empirical Relevance of Source-Consistency in Welfare Measures”, Environmental and Resource Economics, Volume 59, Issue 3, November 2014, Pages 337-361. Halvor Briseid Storrøsten, Prices Versus Quantities: Technology Choice, Uncertainty and Welfare, Environmental and Resource Economics, October 2014, Volume 59, Issue 2, pp 275-293. “Scientific Ambiguity and Climate Policy”, Environmental and Resource Economics, Volume 55, Issue 1, Pages 21-46 (published May 2013). DOI 10.1007/s10640-012-9612-0. “Biology as a Source of Non-convexities in Ecological Production Functions” Environmental and Resource Economics, Volume: 51 Issue: 2 Pages: 189-213 DOI: 10.1007/s10640-011-9494-6 Published: February 2012. Stepping Stones for Biological Invasion: A Bioeconomic Model of Transferable Risk Environmental and Resource Economics, Volume 50, Number 4, 605-627, DOI: 10.1007/s10640-011-9485-7. Cass R. Sunstein and Richard Zeckhauser (2011) Overreaction to Fearsome Risks, Environmental and Resource Economics, Volume 48, Number 3, 435-449, DOI: 10.1007/s10640-010-9449-3.